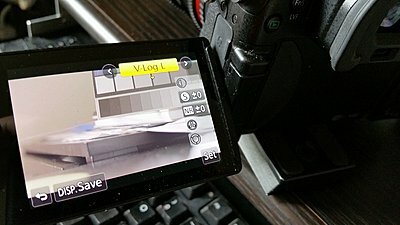 Get GH4 V-LOG for FREE !! Someone posted this on a chinese gh4 forum. Download the free firmware 2.3, install in camera, use the smartphone image app to change to V-Log-L.
Re: Get GH4 V-LOG for FREE !! Once you select VLOG via image app, save it to a custom setting so you wont be doing this via the app everytime. The Vlog option disappears if you change the profile via camera menu. Super simple. I was on the fence about paying $100 for it. With the fence taken down, it's an easy line to cross. Could you go through the steps of what to do in the most simple terms for us least sophisticated computer people? Download and install the 2.3 firmware. Start the WiFi on the GH4. Install the Panasonic Image App on your smartphone or tablet. Connect your smartphone or tablet to the GH4's WiFi access point. Launch the Panasonic Image App while your camera is set to Movie Mode. Use the Remote Control feature to access the picture profiles and set it to VLog L.
On your camera, bring up the Custom Profile screen and select Disp.Save and save it to your Custom slot. But why will it only allow me to shoot at 400 ISO? And there seems to be a LOT of noise on it... Im just letting the camera point at a blank black screen and tons of noise pixels are popping up randomly. But why will it only allow me to shoot at 400 ISO? It doesn't only allow you to shoot at 400 ISO, it simply will not go under 400 ISO. That's the base sensitivity of the GH4. If you go lower, you are in negative gain and it kills the dynamic range of the sensor. And there seems to be a LOT of noise on it... Im just letting the camera point at a blank black screen and tons of noise pixels are popping up randomly. It will be noisy, especially if not properly exposed. Pointing the camera at a black screen is underexposing the entire sensor, and will lead to noise just as much as raising the ISO to insane levels. Yeah I meant lowest was 400 ISO. And yeah it's REAL noisy. Reminds me of my old Mini35 when I had the JVC-100. Regarding just pointing the camera at a black screen. I did it by mistake and just noticed all the random flicker of noise pixels.. In VlogL try to test from 1250 and 1600 iso. I seem to get better noise handling at those. Especially the 1600. There must be a reason why the sony A7xx cameras only do log at very high iso's and noise must be one of it. I'm basing observation this from a test on a high contrast scene of a model indoors by a window, balancing exposure with sky and shadows indoors. I think you may be right.. I just shot something at 1600 iso and it seems much better, but then again, if you like the film grain look, and In do to some extent, the 400 iso is fine. According to Barry Green Vlog L maxes at 79 IRE. Middle grey is about 42 IRE. So if one uses zebras set them to clip at 80%. It seems even better and noise free at 2000 ISO. But I would need to do a better test. The loophole is on the Image App, to prevent it from updating to a "fixed" version, go to your app settings and turn OFF Auto update. If on an android, thats the playstore>settings.